Traveling has always been a stressful event for me. The long airport waits, the frantic rush to meet deadlines, the unexpected fees and price fluctuations, the potential for lost luggage or misplaced mobile phones Was Your Android Phone Lost or Stolen? This Is What You Can Do Was Your Android Phone Lost or Stolen? This Is What You Can Do There are many good options for remotely locating your stolen phone, even if you never set anything up before you lost your phone. Read More — all of that brings a lot of anxiety my way. Maybe you feel the same way. Wouldn’t it be nice if traveling could be a blissful affair? Wouldn’t you be more inclined to travel if you could put a genuine smile on your face from the moment you depart to the moment you arrive back at home? I know I would. Fortunately, with a bit of work, all of that is easy to overcome. All you need is a healthy dose of technology and a few tweaks to your traveling mindset. Here are the skills you’ll need. The willingness to plan and research is a non-negotiable skill. In fact, I’d consider it to be the most important skill by a longshot — so important that without it, stress-free travel is pretty much impossible. That’s not an exaggeration. Planning does not necessarily entail a full-blown itinerary of your entire trip, breaking down every single hour into a schedule that leaves you no room for deviation. However, the more you plan, the less likely you are to be caught off guard by an unforeseen issue. If you’re traveling abroad, you’ll want to check out these free international travel guides The 10 Best Free International Travel Guide Websites The 10 Best Free International Travel Guide Websites Read More . They can help you find the best destinations, landmarks, flights, and hotels depending on the kind of trip you’re taking: business, vacation, expeditionary, etc. To save the most money, you’ll want to look into as many hotels as possible to get the best deals, which isn’t that hard if you use these hotel search engines 10 Best Hotel Search Engines to Get the Best Deals When You Travel 10 Best Hotel Search Engines to Get the Best Deals When You Travel Are you a last minute hotel booker or one who plans out trips months in advance? If you are a business traveller, chances are that you are the former. If you aren't, then you are... Read More . Similarly, be aware of these rules for finding cheap flights 5 Rules to Finding Cheap Airline Flight Tickets 5 Rules to Finding Cheap Airline Flight Tickets Who says you can’t fly for cheap? Sometimes it comes down to whether or not you click the right links, search the right terms, or pick the right times to search the web. Read More in order to save as much as you can on airfare. 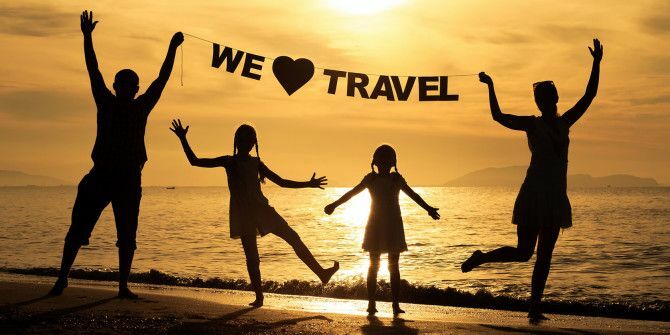 And for those of you traveling for vacation, you really ought to look into saving money with a vacation package How to Save Money on Your Next Vacation Package How to Save Money on Your Next Vacation Package We all need a proper vacation now and then. If a holiday is on your horizon, you consider booking a vacation package. Here are some options. Read More . A vacation package usually combines the flight and hotel into one, along with additional services like car rentals and entertainment events, and the result can be cheaper than if you booked it all separately. One caveat with researching all of these details is that you’ll frequently run into fake online reviews The Scourge Of The Web: Fake Reviews & How To Spot Them The Scourge Of The Web: Fake Reviews & How To Spot Them "User reviews" are actually a pretty recent phenomenon. Before the prevalence of the Internet, user reviews were called testimonials, and you’d only see them on TV commercials and product pages. Nowadays, anyone can write anything... Read More , which are often indistinguishable from real reviews. As such, online reviews can be useful as long as you know what to look out for. There’s no worse feeling than being a thousand miles out and realizing that you left an important item or device back at home on your coffee table. Well, there is one feeling that’s worse: realizing that you forgot to bring multiple things along with you. You cannot neglect the importance of packing ahead of time. In a way this is just an extension of planning ahead, but it’s crucial enough to deserve its own point. You should be packed and ready to go at least 24 hours before your time of departure, which should give you enough time to remember anything you might’ve overlooked. If you’re the kind of person who forgets something on every trip, have no fear. There are a handful of web tools and checklists that you can use to make sure that you never forget anything ever again. We’ve covered PackWhiz, UniversalPackingList, and DontForgetYourToothbrush, which are all good places to start. As for the actual act of packing, there are techniques you should know to maximize the space you have available. Pinterest is chock full of packing tips and advice, so be sure to give it a browse. If you’ve never used Pinterest before, don’t worry. Pinterest is easy The Unofficial Pinterest Guide The Unofficial Pinterest Guide This Pinterest guide will quickly show you how to use Pinterest and all of its features. This guide outlines everything there is to know about Pinterest. Read More . Another thing you want to make sure you pack: your electronic devices. Whether that means something as simple as your smartphone, something as expensive as your new laptop 5 Mistakes You Should Avoid When Buying A New Laptop 5 Mistakes You Should Avoid When Buying A New Laptop The laptop has, for many people, become the only home computer needed. This means picking the right system is both more important, yet also more difficult. Read More , or something in the middle like a portability-friendly tablet 7-inch vs. 8-inch Tablets: Do You Really Need The Extra Inch? 7-inch vs. 8-inch Tablets: Do You Really Need The Extra Inch? The tablet's rise has predictably led to a diversification of the devices available. Display sizes now ranges between seven to eighteen inches, and everything in between. Consumers are certainly spoiled for choice. Most people, however, end... Read More . Be sure to take along your chargers and relevant peripherals. Then again, taking one of these along with you might cause more stress because you’re constantly worried about it being broken, stolen, or lost. That’s why we think the Chromebook is the ultimate travel device Your Chromebook As The Ultimate Travel Device Your Chromebook As The Ultimate Travel Device If you're deciding which device to get for your next trip, you may consider checking out Chromebooks. But why choose a Chromebook for travel? Because, when it comes to travel, they are spot on. Read More . It’s lightweight and productive, yet cheap enough that a disaster won’t be the end of the world. Regardless of what you take along, if you really want to minimize the potential for device-related stress, do follow these crucial tips when traveling with an electronic device 8 Crucial Things You Should Know Before Travelling Abroad With Your Phone, Tablet, Or Laptop 8 Crucial Things You Should Know Before Travelling Abroad With Your Phone, Tablet, Or Laptop If you're about to go international with your smartphone, tablet and/or laptop there are a few things you should know before you go. You might need extra peripheral devices and plugs, entertainment and maps pre-downloaded,... Read More . You won’t regret it. Whether you’re driving a few hours out of town or flying to a country on the other side of the globe, it’s important that you get into the mindset of a traveler — and a big part of this is being aware of the mannerisms and etiquette that are expected of you wherever you end up going. For example, gestures or tones that are acceptable in one country may be construed as aggressive or offensive in another country, and this could be a source of friction for you. We recommend consulting a resource like Travel Etiquette or Kwintessential’s International Etiquette Guide to minimize this. If you plan to travel in a region for months or years at a time, you may want to learn the language of that region. These days there are language-learning mobile apps The 8 Best Language Learning Apps That Really Work The 8 Best Language Learning Apps That Really Work Want to learn a language free? These are the best free language learning apps that will have you speaking a new language before you know it. Read More that can really speed up the process. If you’re just going for vacation though, this might be overkill. Tipping is another piece of etiquette that you shouldn’t forget. While some countries discourage or even outlaw the practice of tipping for service, there are many service workers out there who rely on tips to make a living. Not sure how much to tip? Use a tip calculator app Calculate Tips And Split Bills With These Beautiful Smartphone Apps Calculate Tips And Split Bills With These Beautiful Smartphone Apps Don't let your lack of mental math skills embarrass you when the bill hits the table -- whip out your smartphone and fire up one of these great apps. Read More . So you’ve gotten this far. You’ve done all of your research, you’ve planned everything out so that nothing can catch you off guard, and you’re all packed and ready to go. If you’re lucky, you’re about to have the time of your life. But most of us aren’t so lucky. One thing you should try is to practice mindfulness 3 Apps To Help You Practice Mindfulness in 2014 and Beyond 3 Apps To Help You Practice Mindfulness in 2014 and Beyond If you feel like the past year went by like a jet plane, you might be doing something wrong. Read More . This method rooted in Buddhist philosophy is all about accepting the here and now for what it is. It may sound a bit hokey out of context, but it does provide some practical anti-stress benefits so do give it a try. Or you could take it one step further and practice meditation Meditation Made Easy: Tools & Resources To Aid Your Well-Being Meditation Made Easy: Tools & Resources To Aid Your Well-Being If you have come to the conclusion that meditation is a method to calm your mind and achieve well-being worth trying, then we can help you with resources and tools. Read More . This can be tough when you’re out traveling, which is where these mindfulness meditation apps Learn Meditation On Any Device & Don't Spend A Dime Learn Meditation On Any Device & Don't Spend A Dime Contrary to popular opinion, you can meditate without a yoga mat, religious guidance, a peaceful personal space, incense candles, and any other apparatus. Here's a simple tool to help you begin. Read More come in handy. And if traveling hiccups really have you strung out, consider installing these stress-relieving apps Stop. Breathe. Relax. 7 iOS Apps To Relieve Stress Stop. Breathe. Relax. 7 iOS Apps To Relieve Stress What a stressful day! We all have them from time to time, and while the best possible way to relax (at least in my book) is to leave everything and take a walk outside, this... Read More , these mind-clearing apps The 10 Best Calming Apps to Relax, Destress, and Clear Your Mind The 10 Best Calming Apps to Relax, Destress, and Clear Your Mind Life can sometimes overwhelm you with stress and anxiety. That's when these calming apps can help you destress and clear your mind. Read More , and even these focus-required mobile games 5 Free Android Games To Help You Lower Your Stress Levels At Work 5 Free Android Games To Help You Lower Your Stress Levels At Work Ever since I've had an Android phone, I've always been on the look out for addictive games that have the ability to capture your focus and hold it for a long period of time. We've... Read More that can distract you from the stresses of something like a delayed flight. If I had to boil it all down into one quick tip, I’d refer to the wisdom of Benjamin Franklin himself: if you fail to plan, you’re planning to fail. Or in this case, get everything organized and researched and packed long before you step out the door and there’s a good chance everything will go smoothly. How have you dealt with stressful travel? What other tips, tricks, and apps have you used to ease the process? We’d love to know! Share with us in the comments below.